Your steering wheel rests straight up and your car drives ahead without pulling to the left or right. You can easily control your vehicle's direction with a simple touch of the steering wheel. When driving your car happens this smoothly, it means your wheel alignment is correct. Your vehicle's wheel alignment uses a set of angles and measurements from the manufacturer, known as toe, camber and caster. All of these make your vehicle easy to control. When your wheel alignment is accurate, your tires will last as long as possible, and your suspension components will endure the least amount of stress. Your wheel alignment is an adjustment that can be affected by a handful of circumstances. If you can't avoid a big pothole, the impact can bend a part or force an alignment angle to move. If you hit a curb, the same thing can happen. If you have a loose or worn suspension or steering part - such as a tie rod end or broken coil spring - your wheel alignment will become inaccurate. When your wheel alignment is incorrect, this puts strain on your steering and suspension, exacerbating the problem and often causing premature wear on those parts. Incorrect toe and camber cause excessive wear on your tires, cutting tens of thousands of miles of life from your tread in no time. Improper caster can make your vehicle hard to steer. In all situations, improper wheel alignment can make your car difficult and even dangerous to control. At the first sign of wheel alignment issues- such as a steering pull either left or right, or abnormal tire wear - your wheel alignment should be checked. A routine wheel alignment can be an annual part of your regular maintenance to keep your car operating as smoothly as possible. At Babcock Auto Care, your wheel alignment is addressed by our ASE-Certified Master Technicians. With their years of experience in steering and suspension systems, they have the expertise to find and repair any cause of your wheel alignment issues. Whether you have a bent steering part or just need a routine alignment, we will do it for you efficiently and accurately. 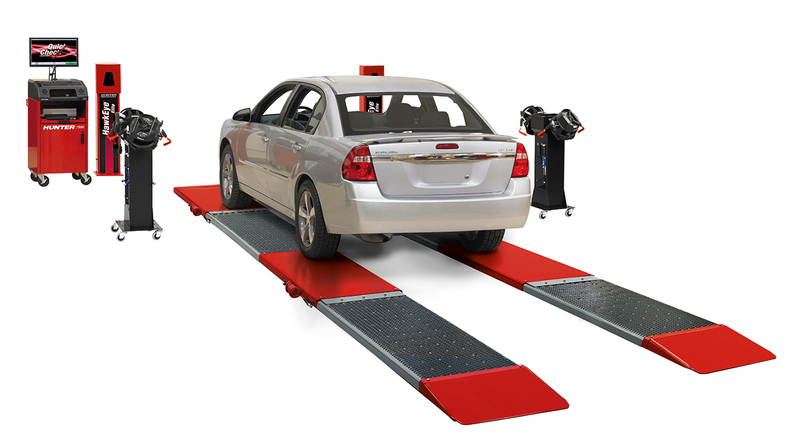 We use precision computerized wheel alignment state of the art Hunter machines for accurate alignments. If we find a part that needs replacement, we'll notify you right away so you can make your own repair decision.